Directed by Phil Johnston and Rich Moore. Featuring the voice talents of John C. Reilly, Sarah Silverman, Gal Gadot, Taraji P. Henson, Jack McBrayer, Alan Tudyk, Jane Lynch, Alfred Molina, Ed O’Neill, Sean Giambrone, Flula Borg, Timothy Simons, and Ali Wong. From the keyboard of an enthusiastic Wreck-It Ralph admirer, Ralph Breaks the Internet fails to reach Beyoncé-level notoriety despite diving head-first into world-wide-wackiness. At its best when trumpeting an ode to friendship revealed as the film’s core, but online gags never top Wreck-It Ralph’s near-perfect high score. Ralph (John C. Reilly) encounters spam marketers, DLC add-ons to gamer nirvanas, and learns why Rule #1 is “NEVER read the comments.” Fairly standard technology satire that’s sugary-sweet, passable enough until a heartfelt Act III seals Ralph and Vanellope’s (Sarah Silverman) journey with a million floating “Likes.” Welcome to the Internet Ralph, we’re happy it didn’t destroy you. In Disney’s web-surfing sequel, Litwak’s Arcade plugs in a new device: “WIFI.” Sonic The Hedgehog explains that Mr. Litwak’s (Ed O’Neill) just connected his establishment to the “Internet,” but Surge Protector (Phil Johnston) refuses to let anyone inside. That’s until a freak accident causes an arcade player to break Sugar Rush’s controller wheel and the only replacement part in existence is for bid on eBay starting at $200. It’s up to Ralph and Vanellope to save Sugar Rush from being salvaged, leaving Vanellope gameless, but the Internet’s limitless wonders may be too inviting for one character to refuse. After mistaking eBay for a harmless numbers game – and overbidding the Sugar Rush wheel to an astronomical amount – our digitized duo finds themselves inside MMORPG Slaughter Race. Ralph’s chop-shop-dystopian nightmare, Vanellope’s high-octane circuit fantasy. 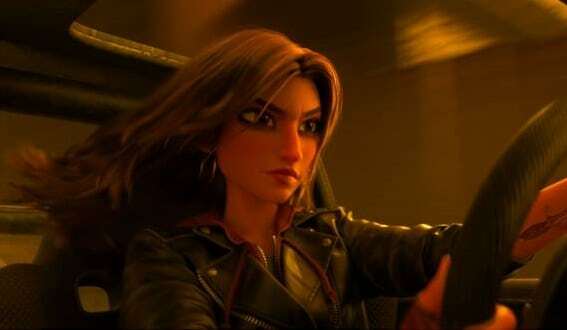 We meet Shank – Gal Gadot’s fast-and-furious racer rebel avatar – who’s impressed by Vanellope’s drifts and maneuvering around Slaughter Race’s infinite dangers (including sewer sharks). Ralph Breaks the Internet best serves this Grant Theft Auto gaming universe where Vanellope finds wonder and purpose, along with her own Disney Princess sing-along after gazing into “important water.” Video game satire is what this franchise does best, proven by comparison here. 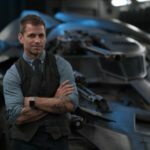 Outside of Slaughter Race – where Ralph skyrockets to video stardom under the tutelage of BuzzzTube curator Yesss (Taraji P. Henson) – excitement and humor charges with less horsepower. 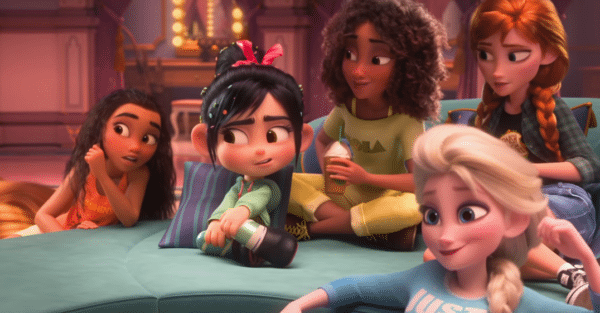 Vanellope teaches Disney’s Princess squad about “comfy” clothing (where can I buy Moana’s “Shiny” tank? ), but outside this hilarious (and deserved) roasting of princess generalizations – no mother figures, saved by muscular men, can communicate with animals – we’ve seen all Ralph’s Internet gags before. 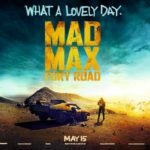 Little blue birdies as tweets, websites represented as skyscrapers in bustling megacity utopias, underground Dark Web crime dens – Ralph Breaks the Internet is everything from the Silicon Valley credits to cartoon episodes. Vividly detailed, architecturally banal. On display are character arcs, not mock YouTube videos. Ralph – content with Litwack’s nine-to-five rhythm – cherishes his “You’re My Hero” cookie medal bestowed by best friend Vanellope. As he begins to realize his pint-sized sidekick demands bigger and more exciting ambitions – Slaughter Race – the film shifts from wanting more from our everyday lives to a finale about teary reconciliations. About the distance-induced pain of allowing someone to exit your life physically. 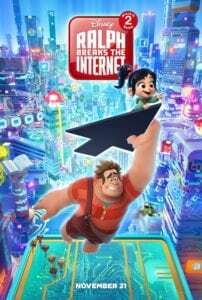 The insecurity, selfishness, and emotional hole left to mend, and how hurt begets happiness for others as Ralph – clutched by a King Kong/World War Z inspired “Ralph Virus” destroying “the Internet” – tells Vanellope everything will be OK because they’re still bonded despite geographical gaps. Not a foreign childhood learning experience, but Ralph Breaks the Internet drives this stake clean home. 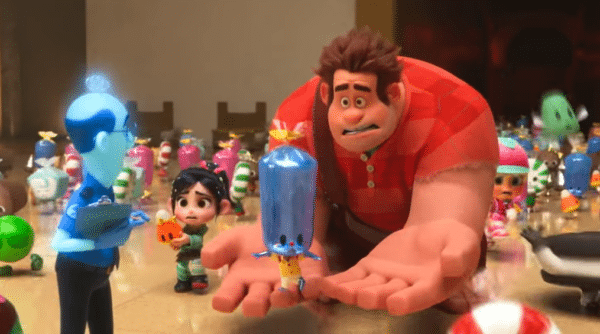 While Ralph and Vanellope tie together loot quests, Gord’s nightmarish arm extensions and an out-of-control virus that duplicates faulty coding, it’s not a neat wrap-up. Their journey accumulates unexplored or ignored subplots like Felix (Jack McBrayer) and Calhoun’s (Jane Lynch) adopting 15 homeless Sugar Rush drivers as a direct commentary on parenthood (spicing up relationships). Internet satire is base-level at best as Ralph is only bothered in a single scene by abhorrent trolls dragging his name. Ralph Breaks the Internet Froggers from sentiments of unfulfilling daily routines to monetized online fame until finally landing on a heroic third act – but it’s a hazardous course. Luckily, what Disney does right by Ralph Breaks the Internet shines brighter than unfocused glitching. Arcade gamers/online users are primarily female, and Disney roasts their own “Princess” culture over a spitfire. References to Zangief’s patterned waxing, root beers at Tapper’s and Shank’s Slaughter Race hellscape evoke Wreck-It Ralph’s finest qualities. That Baby Groot appearance? Aces as Oh My Disney becomes a fan convention where users ask “celebrities” questions instead of clicking on website buttons. Ralph doesn’t really “break” anything in the viral sense – nor explore the dangers of the internet that harshly – but as a sequel, characters who have no problem justifying a third cyberspace adventure. Maybe this time addressing ongoing console wars?